Proud Lyrebird Steps Up To The Microphone The pheasant-sized superb lyrebird doesn't look like much until you get to its tail. Sixteen feathers create a gorgeous pinnacle of lacy white and brown filaments shaped like the ancient musical instrument the lyre. 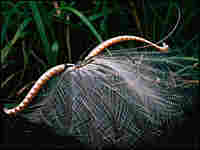 A superb lyrebird displays its tail in Sherbrooke Forest, southeast Australia. 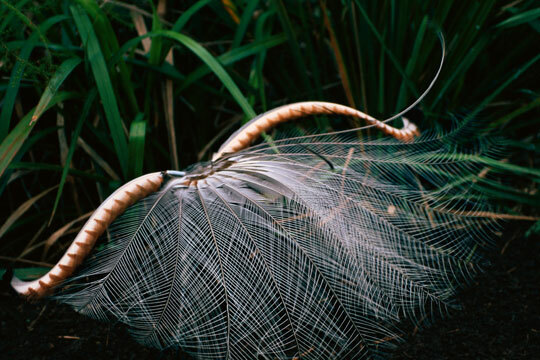 The pheasant-sized superb lyrebird doesn't look like much until you get to its tail. There are 16 feathers, the two outermost being erect and creating a gorgeous pinnacle of lacy white and brown filaments shaped like the ancient musical instrument the lyre. These native Australians are ancient birds; scientists have found fossils dating back to about 15 million years ago. Perhaps the most spectacular feature of the bird, though, is its ability to mimic the calls of other birds of the forest. Experts say they've heard the lyrebird imitate at least 12 other species. The lyrebird heard in the sound recording above is standing on a mound in a forest. "He's trying to attract a female into his mound," says wildlife expert David Stewart. "But at the same time, he's also letting other lyrebirds in the area know this is his territory." 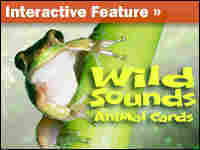 Stewart was listening to a recording of another lyrebird through his headphones when he met the lyrebird featured here. "This lyrebird must have heard the sound through my headphones, jumped down in the track in front of me, about two meters, looked at me, cocked its head and started to sing," Stewart says. "It actually sung for 20 minutes. And it almost looked at me to say, 'I heard that sound, and I can do better.'"